What a thrill the opening ceremony was watching all-time Major League home run champion Hank Aaron walk arm-in-arm with, and be handed the ceremonial first pitch ball by, the all-time Japan home run champion and 2006 Japanese manager, Sadaharu Oh. Hank delivered the first pitch to the Cuban catcher, Ariel Pestano, a veteran of international play and one of the key components of Cuba’s incredible run in the tournament. ( 350K), the 32-year-old veteran of three Olympics and several World Championships, and Yadel Marti, the young right-hander who has yet to give up an earned run in the tournament. The Dominican team, winners of each of its two earlier rounds, squandered chance after chance and had the heart of its lineup up twice with multiple runners on base but could only score one run off the two Cuban pitchers. The two-run margin of victory seemed luxurious, since each of the four games that allowed the four semifinalists to advance were one-run games (Korea/Japan; U.S./Mexico; D.R./Venezuela; Cuba/Puerto Rico). My mistake yesterday. I should have reread my manual on the way out to San Diego. The rules called for six umpires for the semifinals and finals so there were six umpires working both games today, and the games seemed to be decided without any serious controversy. Another fact I did not know until I attended the umpire briefing this afternoon: The games in this final round are played to conclusion. There can be no tie. But — if, in the opinion of the Technical Committee on hand, the pitching staffs of both teams are depleted due to a very long extra-inning game — the Committee could suspend the game to be completed tomorrow when the pitchers become eligible to pitch again. Given that the teams each only had one or two pitchers unavailable today and tonight, that would have required a game probably more than 20 innings so it is not a rule that would ever be likely to be invoked. Tonight we had the first decisive win in what seems like a week. 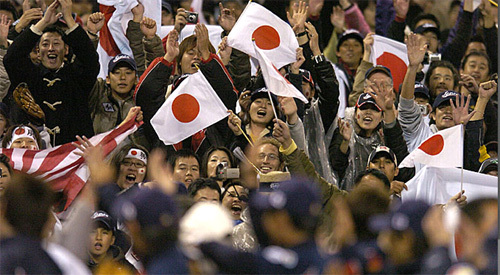 Contrary to the song lyrics, tonight in the seventh inning in Southern California it rained — runs for Japan ( 350K) and drops on the field and on fans. Until then, it had been a great defensive struggle with neither team mustering up much offense. At the end of the day, Korea could not pull the hat-trick and beat Japan three straight times. Korea had a great tournament and cleary is a force in international baseball. And its fans tonight were terrific. Most of the stadium was decked out in Korean gear and they cheered every pitch and play even when their heroes went down, 5-0. They even cheered throughout a 45-minute rain delay in the eighth inning and right until the last out of the game. The Padres have been great hosts. Owner John Moores, club president Sandy Alderson, **** Freeman, Jeff Overton, Richard Andersen and countless others have interrupted their Spring Training and season preparation and put on a great show — even with the rain. Commissioner Selig was on hand today, along with a gaggle of Club owners and officials — I saw Tom Werner and Larry Lucchino of the Red Sox, Vince Naimoli of the Devil Rays, Eddie Einhorn of the World Series champion White Sox, and there may have been others. Don Fehr of the MLBPA is here for the weekend as is Mayor Anthony Williams of Washington and his wife. What has been done with Petco Park and the surrounding area is a perfect model for the Anacostia area in D.C. The ballpark is the centerpiece of massive vibrant commercial and residential growth and urban rejuvenation. Had fun at the Habitat for Humanity event this morning. I can’t say my carpentry skills have improved with age. 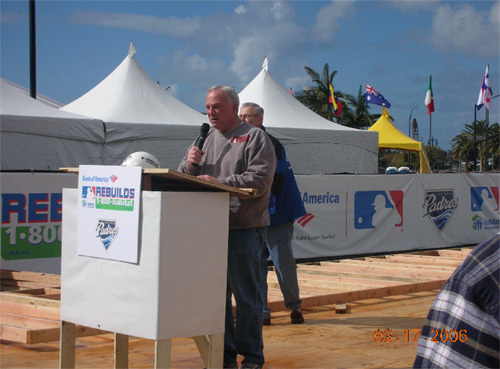 San Diego Mayor Sanders (pictured) was on hand, along with Alderson from the Padres, and Bob Tjosvold from sponsor Bank of America — which has been such a terrific supporter of Baseball throughout the country, and so generous in the community helping with so many events like the Habitat event today. I also had the privilege of meeting Chris Clarke, a senior vice president from Habitat from Humanity, who has been so helpful to us since MLB’s project inception in Houston last July, and Cheryl Keenan, the San Diego executive director for Habitat for Humanity. 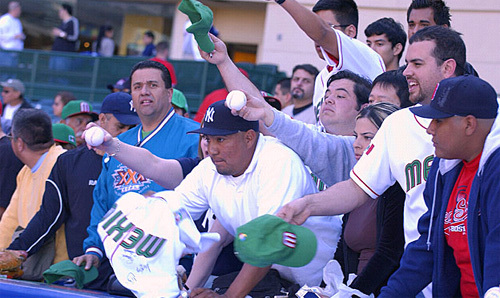 So it is two teams largely unknown to U.S. fans before this event that are in the first World Baseball Classic finals. Both are very disciplined, execute every phase of the game well, and have gotten good pitching in every game that mattered. I think Japan will win a low-scoring game, but I thought the Dominican Republic would make the finals so . . . let’s see what happens Monday night. Tune in — it will be fun. 1. 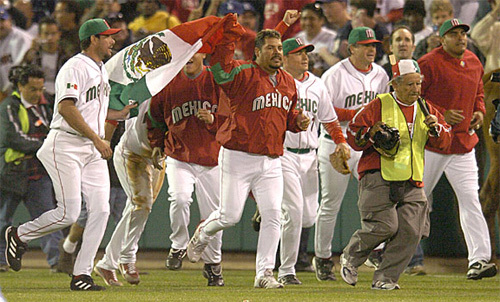 I was struck by how excited the Mexican team and their fans were after the game, even though they had been eliminated. Beating the U.S. team was obviously a big deal. They played and pitched well, and executed when they had to. Vinny Castilla moved a lot quicker than most 38-year-olds with a bum knee. 2. Even though it was the difference in the game, I was glad my fellow MLBlogger Jorge Cantu drove in Mario Valenzuela with the run in the third inning ( 350K). The replays were clear about the ball hitting the foul pole at least eight or 10 feet up the pole. There was no question it should have been a home run. It would have been brutal to the long-term credibility of this event if the U.S. team advanced on two questionable calls in two different games in the second round. Maybe these games are already significant enough that we should use foul-line umpires like we do in the playoffs and All-Star Game. I think back to the first exciting Dominican Republic/Venezuela game in Orlando, where the third base umpire, Fred van Gronigen, from The Netherlands correctly called a ball in play off the outfield wall that could have been called a home run and impacted the outcome of that game and perhaps the round. The call last night was missed, pure and simple. ( 350K) and probably deserved a better fate. From a personal standpoint, I hope he comes back sometime this year. His retirement will leave a hole in the game. 4. I think the biggest surprise to me is not that the U.S. team lost this game, necessarily, but that it ended up 3-3 over six games. I don’t think anyone thought it was a .500 team, even with the injuries and non-participating players. It does demonstrate how much better competition has gotten worldwide. Although that should not be a shock, I guess, when you consider that Ichiro won the Rookie of the Year and MVP awards his first year in the Major Leagues, and Chan Ho Park and Hee Seop Choi have certainly performed at a high level since coming to the States. One point to those who are posting that the U.S. was arrogant and that players A, B and C should have played: Remember, this was a voluntary signup. Some players chose not to participate because they did not feel ready physically and others because they just did not want to play, not because they were not "chosen." Could some of them have helped? Sure. But if you look at the roster that was assembled and the starting lineup that went out on the field, there is no team in the Major Leagues that would not like to field that team during the season. Interestingly, the newest ESPN SportsNation poll has 78 percent believing that the U.S. loss will be a neutral or a positive in that it will drive interest in other countries, and 77 percent are still interested in the remaining games. The ratings last night were 2.1 on ESPN, meaning that almost 2.5 million viewers tuned in, making it the most-watched game of the Classic so far in the United States. It was the most watched cable show among men 18-49 and 25-54 yesterday, against, of course, the strong competition of the NCAA Tournament. As I said, we arrived in San DIego this afternoon. The weather is cool but, more significantly, as I write this it is pouring rain. The forecast for tomorrow is dicey. I hope that if we get a game started, we can finish it. Given the format of the event, it would be a shame to get a game washed out or suspended. We’ll keep our fingers crossed for tomorrow. As I mentioned last week, I agree with the posters who would prefer to see cross-over semifinals, i.e, Cuba vs. Korea and Dominican Republic vs. Japan, with the winners meeting Monday. I hope that will be on the agenda to review for 2009. Rain or shine, we will be out at the Habitat for Humanity site tomorrow morning along with San Diego Mayor Jerry Sanders and officials from the host San Diego Padres. The buildout at the All-Star Game last July in Houston got a lot of coverage as we built a number of homes that were shipped to the Gulf Coast, and this weekend, three more will be built and shipped to the same area. Some of the players have agreed to help out on Sunday in a terrific show of international compassion and sportsmanship. I will try to post a picture tomorrow night. Can Korea actually beat Japan three times? Can Cuba do to the Dominican team what it did to Puerto Rico: Come back from a thumping and win when absolutely necessary? Tune in tommorow. On the field before Game 1 of the first round in Tokyo, from left to right: John McHale Jr., me, Tommy Lasorda and Peter O’Malley.